We have created our own line of 19" housings specifically designed to house Soekris NET4xxx and NET5501 computers. We are working on adding support for additional boards and cards, so check here often! NEWS: STARTING WITH APRIL 2008, ALL OUR CASES SUPPORT ONLY THE NEW 25W POWER SUPPLY! Robust case, built to last! Fits one or two 4xxx or 5xxx boards + one or two power supplies + PCI cards (depending on case configuration). Black powder coating for the top and bottom metal covers, galvanised steel mounting plate and elox Aluminum for front/back plate. 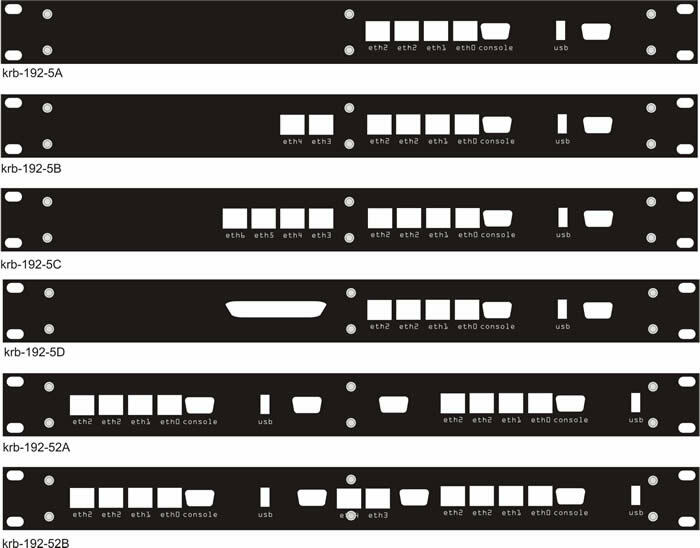 Front plate is available in different versions depending on number of nics. New 25W power supply (P/N GS25B12) fits inside and is connected to board's MTA header. Pre-drilled and threaded holes on the mounting plate for mounting spacers in different configurations . Laser engraved standard generic labels on the front plate. Flexibility: one case fits all supported boards and PCI cards! You need just different front panels to accomodate different hardware combinations. NEW: header(s) for second serial port! Kerberos.si 19" rack case for Soekris with 3 ethernet ports, black, no company logo. Holds a 4501/4801 board, 25W standard power supply (not included) and any full-size PCI card (no holes). krb_191_2A DUAL Kerberos.si 19" rack case for Soekris with 2x 3 ethernet ports, black, no company logo. Holds two 4501/4801 boards, two standard power supples (not included) and any low-profile PCI card (no holes). Kerberos.si 19" rack case for Soekris with 5 ethernet ports, black, no company logo. Holds a 4501/4801 board, 25W standard power supply (not included) and any full-size PCI card (holes for lan1621). krb_191_2B DUAL Kerberos.si 19" rack case for Soekris with 2x 5 ethernet ports, black, no company logo. 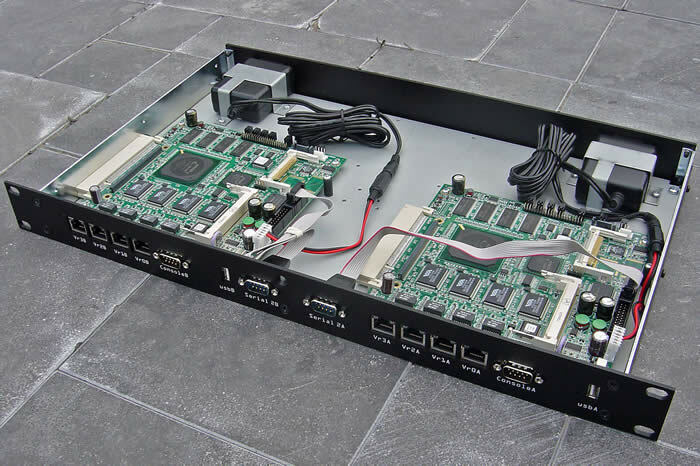 Holds two 4501/4801 boards, two standard power supples (not included) and any low-profile PCI card (holes for lan1621). Kerberos.si 19" rack case for Soekris with 7 ethernet ports, black, no company logo. Holds a 4501/4801 board, 25W standard power supply (not included) and any full-size PCI card (holes for lan1641). Kerberos.si 19" rack case for Soekris with 2 ethernet ports, black, no company logo. Holds a 4521 board and 25W standard power supply (not included). krb_191_5A Kerberos.si 19” rack case for Soekris 5501 with 4 ethernet ports, second serial port, black, no company logo. Holds a 5501, 25W standard power supply (not included) and any full height PCI card (no holes). krb_191_5B Kerberos.si 19” rack case for Soekris 5501 with 6 ethernet ports, second serial port, black, no company logo. Holds a 5501, 25W standard power supply (not included) and any full height PCI card (holes for lan1621). krb_191_5C Kerberos.si 19” rack case for Soekris 5501 with 8 ethernet ports, second serial port, black, no company logo. Holds a 5501, 25W standard power supply (not included) and any full height PCI card (holes for lan1641). krb_191_5D Kerberos.si 19” rack case for Soekris 5501 with 4 ethernet ports, second serial port, black, no company logo. Holds a 5501, 25W standard power supply (not included) and any full height PCI card (one big hole). krb_191_5F NEW Kerberos.si 19” rack case for Soekris 5501 with 4 ethernet ports, second serial port, black, no company logo. Holds a 5501 + 4 or 8-port serial card, 25W standard power supply (not included). krb_191_5G NEW Kerberos.si 19” rack case for Soekris 5501 with 4 ethernet ports and one Traverse ADSL Viking card, second serial port, black, no company logo. Holds a 5501, 25W standard power supply (not included) and a single port ADSL card (xc-p-adsl2-v). krb_191_5H NEW Kerberos.si 19” rack case for Soekris 5501 with 4 ethernet ports and one Traverse ADSL Solo card, second serial port, black, no company logo. Holds a 5501, 25W standard power supply (not included) and a 2 or 4 port ADSL card (xc-p-adsl2-s2 or xc-p-adsl2-s4). krb_191_52A DUAL Kerberos.si 19” rack case for Soekris 5501 with 2x 4 ethernet ports, 2x second serial port, black, no company logo. Holds two 5501 boards and two standard power supplies. krb_191_52B DUAL Kerberos.si 19” rack case for Soekris 5501 with 4 + 6 ethernet ports, 2x second serial port, black, no company logo. Holds two 5501 boards, two standard power supplies and one low-pci card (holes for lan 1621). Additional front plate for Kerberos.si 19" rack case, 3 ethernet ports, black, no company logo. Additional front plate for Kerberos.si dual 19" rack case, 2x 3 ethernet ports, black, no company logo. Additional front plate for Kerberos.si 19" rack case, 5 ethernet ports, black, no company logo. Additional front plate for Kerberos.si dual 19" rack case, 2x 5 ethernet ports, black, no company logo. Additional front plate for Kerberos.si 19" rack case, 7 ethernet ports, black, no company logo. Additional front plate for Kerberos.si 19" rack case, 2 ethernet ports (for 4521), black, no company logo. krb_192_5A Additional front plate for Kerberos.si 19” rack case for Soekris 5501 with 4 ethernet ports, second serial port, black, no company logo. krb_192_5B Additional front plate for Kerberos.si 19” rack case for Soekris 5501 with 6 ethernet ports, second serial port, black, no company logo. krb_192_5C Additional front plate for Kerberos.si 19” rack case for Soekris 5501 with 8 ethernet ports, second serial port, black, no company logo. krb_192_5D Additional front plate for Kerberos.si 19” rack case for Soekris 5501 with 4 ethernet ports, second serial port, one big PCI hole, black, no company logo. krb_192_5F Additional front plate for Kerberos.si 19” rack case for Soekris 5501 with 4 ethernet ports, second serial port, hole for 4 or 8 port serial card, black, no company logo. krb_192_5G Additional front plate for Kerberos.si 19” rack case for Soekris 5501 with 4 ethernet ports, second serial port, hole for Traverse ADSL Viking card, black, no company logo. krb_192_5H Additional front plate for Kerberos.si 19” rack case for Soekris 5501 with 4 ethernet ports, second serial port, hole for Traverse ADSL Solo card, black, no company logo. krb_192_52A Additional front plate for DUAL Kerberos.si 19” rack case for Soekris 5501 with 2x 4 ethernet ports, 2x second serial port, black, no company logo. krb_192_52B Additional front plate for DUAL Kerberos.si 19” rack case for Soekris 5501 with 4 + 6 ethernet ports, 2x second serial port, black, no company logo. All prices exclude VAT and shipping. The weight of one case is approx. 4.5kg. EU companies that require a valid tax invoice must provide us with their EU VAT number. For orders and enquiries please e-mail us with your request or visit the on-line store at kd85.com. The price is composed of two parts: design & preparation and engraving. A template CDR v12 file is available here. A CDR v11 file is available here. An EPS file is available here. All prices exclude VAT. Please allow 7-14 days for the engraving process.